The charter motor yacht FORCE BLUE is available in the Maldives for charters between February 10 and March 20, 2008. FORCE BLUE is a 207-foot (62.33m) Royal Denship motoryacht based out of Male. CHARTER RATE: Euro 245,000 (high season) Euro 235,000 (low), plus all expenses. We just got back from our first charter of the season, and now have a few moments to get to our email! We had a great summer in the mountains of Colorado where we spent 2 months in Grand Lake Colorado sailing (Eric was racing E-scows on Grand Lake, competing for the Lipton Cup -- he crewed on a boat that got second place! ), water skiing, hiking and camping, doing a bit of horseback riding, and generally resting up and hanging out with our friends. We had a wonderful time and are now gearing up for a very busy season! Unfortunately, I'm using Eric's computer as mine has suddenly refused to recharge itself -- all our pictures are on my computer so I can't send one...sorry! That's OK, Jacques. We'll get some photos when we see you in a couple of weeks when we sail over to the Virgin Islands for the charter yacht shows. Today's boat cat is Jacob who lives aboard the charter motor yacht FLAME. Jacob is a fabulous charter cat. He really does the balance of entertainer, but not too-much-in -your-face charter host. His folks are very pleased with him and Flame's guests have adored him. Jacob is skinny in this picture cause he was still a kitten. He is still pretty slim but he has this funny droopy stomach that the vet says is very normal, just usual in older cats. He likes to interrupt me when I am at the computer. When he was little he would lie on the computer keyboard and roll around listening to it beep! I had to stop that when somehow he managed to make my entire picture file go away. He loves to lie on the counter at the bottom of the steps going into the main salon so he can keep track of everyone. Me, he whacks as I go by so he can get attention. He is playful in the morning and the evening.. right now he is finding the charging cord for the phone a fun toy. He is also fond of hunting flies. I suppose the funniest thing about him is that he uses the toilet. We used the insert to train him and now he is down to the last ring with no litter in it. Last summer Wayne and I did a charter on Eliza (they had no crew and were in a panic) and we told them we come with cat. Jake just rolled with the punches and used the toilet there just like on Flame (on land he uses the great outdoors). Well, obviously I could go on and on about him! He is just the sweetest, good natured cat! You can see another post (June 12, 2006) with Jacob and Flame HERE. Unfortunately, Flame won't be at the November St. Thomas charter yacht show as they will be on charter. But, as we will be in the Virgin Islands aboard our boat, we will probably run into them and catch up on everything... including more pictures! If you are interested in chartering a yacht for next year's Cannes Film Festival (May 14-25, 2008) PLEASE do so as soon as possible. Boats book up quickly and dockage is difficult to obtain the closer it gets. We had a lovely summer on the 14 acres we bought in western North Carolina, SE of Asheville. We bought a 25' marine shipping container to put our "Stuff" in & a 36' 5th wheel travel trailer to call home while we're there. Movin' up from boat bums to trailer trash! We did alot of planting, 5 maple trees, 3 apples, crepe myrtles, roses, day lilies & iris. Charles rented a bush hog & we cleared about an acre of blackberry brambles & grape vines which were taking over the trees (Charles fell in love with this brush hog). Our time there was short but we got a lot done. Next year, nature trails. Look forward to seeing Phaedrus and the gang at the St. Thomas charter yacht show in a couple of weeks! Phaedrus is still OPEN for CHRISTMAS! We had a great season in Newport in June, then Maine July - September and now back in Newport to finish out the charter season. We will again be dockside at the Newport Harbor Hotel for the winter. Only a few miles from our son and his wife. I take care of our 17 month old grandson, Simon two days a week. Quite a change from chartering, but we wouldn't miss this time with him. Next summer we will be sailing to Nova Scotia and chartering there July and early August, then back to Maine for the rest of the season. Good to hear from you, hope both of you are well! Myself and Rich have literally just returned from our hol's! We spent one week in Orlando and four weeks in Peru! Peru was an amazing country, lots of desert which I didn't realise. We had time to do a tour of the whole southern part, starting in Lima, then Nasca to see the strange lines in the desert, from there to Arequipa, where we did lots of activity stuff, quad bikes, horse riding, went to see the largest canyon in the world and the Condors that live there. It is also an area over 5000 metres above sea level so we had the altitude and lack of air to contend with too! We went to Lake Titikaka, the highest navagable lake in the world, took the Orient Express to Cusco, from where we did a week in the jungle of Manu. Lots of insane wildlife, the worst being a tarantula crawling out of Rich's hiking boots! Food was amazing. It was the only time travelling I have put weight on! We ate some weird and wonderful things, we chewed coco leaves for altitude sickness and drank it as tea, we ate guinea pig! (see attached picture), tripe soup, alpaca (related to the Llama, it was my favourite!). Promenade is still available for CHRISTMAS! We are in beautiful Trinidad and Tobago having fun redecorating Blithe Spirit: new deck paint, new cockpit cushions, new pedestal, so more room in the cockpit, new cockpit table, some new sails, lots of fresh varnish, she looks stunning. As for us, after dieting and exercising we are in great shape and ready to start the upcoming season. We are sampling fun Indian vegetarian dishes and adding new recipes to our menu and taking spices back with us to St. Thomas; welcome everyone. Blithe Spirit is still OPEN for NEW YEARS! You can get their "normal" rates HERE then click on MULTIHULLS. These boats offer diving for certified divers at the price of $30/dive/diver. Introducing YES DEAR, a new Voyage 580 (58-foot) catamaran. Yes Dear has three crew, is fully air conditioned and accommodates up to 10 guests in 5 cabins, each with ensuite heads. The Salon features a Bose sound system, a Flat Screen TV, CD, DVD and I-Pod docking station. There are also stereo speakers in the cockpit and on the mast. Each stateroom is equipped with its own flat screen TV/DVD player. Recreational equipment include a 16ft tender with a 90hp engine for waterskiing, tubing, wakeboarding, snorkeling and fishing trips and floating mattresses. Dive compressor for SCUBA diving which is available onboard but not included in your package the rate is $30 per dive/per certified diver (this includes rental of equipment). Some islands in the Leewards and Windwards restrict diving from yachts, diving is then only available with local operators. Standard bar and gourmet cuisine are included in your vacation package, your professional crew of 3 will be your captain, local guide, chef, divemaster and watersport instructor. We are now in Salzburg and our grandkids are with us; they had a vacation week from school. The weather is the same as you said from St. Martin, grey and cloudy. The difference is, it is cold here, I miss the warmth! But the forecast says, next week the sun is back, but temperature is still much colder than in the Caribbean. It is fall and we have a beautiful Indian summer in all colours. We were yesterday with our grandchildren Kay-Vivian (8) and Vanessa (6) in the mountains around Salzburg in a cannyon hiking and we did some pictures. It was really interesting with that loud waterfalls and narrow path hiking up and down through that canyon. Today our son Oliver and our grandchildren driving back home to Stuttgart were they live. Our daughter couldn't come with, she got a new interesting job and couldn't go away. We will stay for 10 more days here in our condo in Salzburg then we drive to Stuttgart to our family and fly out there on Oct. 23rd. back in the warmth! Sasha got thicker hairs, he loves to sit on our balcony outside in the cold looking at passing birds in the trees around. And of course he loves to play with our grandkids. When we drove from Stuttgart to here he was sitting free in the car and was looking outside and after a while he was sleeping all the way. Real travel cat, no problems and such a lovely and good boy with his cute face! We are so happy and lucky to have him around. But he gained weight, I guess the cold makes him eating more. Hope, you are both well - we are doing both fine and Gus' eye is nearly 100% okay again. [Gus had cataract surgery. He had his other eye fixed last year]. Next week in the sunshine we will bicycling along the Salzach River which is close to our condo. SASKIANNA, the 57-foot, Bruce King sloop built at the same Maine yard as her sistership, Whitehawk, is heading to the Caribbean for this coming winter 2007/8 season. Her fine lines, traditional hull and teak decks turn heads wherever she goes. Below decks her white enamel paint and varnished teak trim echo the classic interiors of Nat Herreshoff, set off with slate blue ultra suede upholstery new this spring (2007). 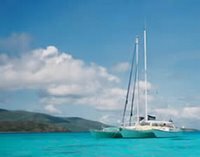 Saskianna has been lovingly and meticulously maintained by professional captains since being launched in 1985. With two guest cabins Saskianna is best suited to family cruising. Her en suite aft master has private access to the cockpit and offers both double and single berths, plus a vanity with seat, mirror and sink. The forward cabin has generous storage, upper/lower single berths and shares the forward head with the crew. Recent upgrades include the installation of air conditioning and electric heads and the refit of a separate crew cabin is close to completion. Currently (as of Oct.14,2007) available for BOTH Christmas & New Years! We look forward to seeing Saskianna at the Antigua Charter Yacht Show in December. Where do you go on vacation when you work and live in the world’s best sailing area? Canada! We had a great time last week hiking the Canadian Rockies! It was the first time in ten years that we played in the snow! The upper elevations were cold on our warm Caribbean toes; but we loved every minute! We started our adventure at Lake Louise spending three days hiking around the magnificent Fairmont Lake Louise Chateau and lake area. Our next couple of days was spent enjoying the views on one of the “10 Best Drives In the World” to Jasper. We wrapped up our week in Banff with a luxurious stay in the Presidential Suite at the Fairmont Banff Springs Hotel. Captain/Chef Mike of Graunya, worked in the windy city this summer sailing on Lake Michigan. This was his second summer season working in Chicago aboard the 36-foot sloop Crescendo and the 76-foot gaff-rigged, topsail schooner Red Witch. Next month Mike will be returning to Graunya, his 51-foot Beneteau, who has spent her summer vacation at a boatyard in Trinidad. This will be Mike's 16th season chartering and he still enjoys it. 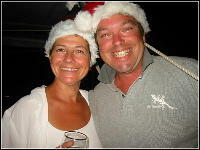 We had a party of three guys aboard Graunya this Spring for the Jimmy Buffett concert in Anguilla. A great time was had by all! Thanks Mike!!! We sent an email to some of our favorite charter boats to ask what they did on THEIR summer vacation. Tim & Julie of the motoryacht McGregor, a 56-foot Hatteras, sent us their newsletter. Click on the image below to see it larger. Tim is a dive instructor and includes resort courses and up to 8 dives/week for certified divers. Charters in the US and British Virgin Islands. More about Caribbean Christmas / New Years availability soon! Here's what we learned about Chris & Julie, owner-operators of the 50-foot Beneteau, BLU MOON. Chris & Julie, on sailing vessel Blu Moon, have spent the summer working on their 200+ year old farmhouse in southwest France, which is renowned for producing sunflowers, red wine, chèvre goat cheese, and foie gras. They purchased the “fixer-upper” in 2004, and have just finished their 3rd summer working on the outside of the house, building a lower terrace and stone barbeque, and coordinating an addition that is being built by a French stone mason and artisan. In June, their roof will be redone in the traditional French style, and next summer they plan on gutting the interior of the house. The supervisors of their house renovation are their two 10-year old Australian Shepherds, Hannah and Mick, who live with a foster family during the chartering season. Wayne and I spent our summer working on our pet projects. Wayne has been finishing his 1931 LaSalle sedan and has started restoring a coupe. We used his 1947 Chevy pickup quite a bit this summer so our yard is just littered with antiques! I just like digging in the dirt. This summer I built a new patio to overlook the fish pond and expanded our dining patio. Our house and gardens are quite respectable now! I've included two pictures. One is of my pond with the new patio and Wayne's sedan in the background. The other is of his "new" project. Yup, this is what they look like when he starts (and he's actually been working on it for two summers!). Thanks Barb & Wayne! We look forward to seeing you in a couple of weeks! We cruised the Med this summer.. Including Palma Mallorca, Ibiza, the French Riviera, and the Italian coast... The weather was mostly good. GOOD NEWS! Harmony is still (as of Oct.5,2007) available for Christmas/New Years! Kerry of the 65-foot Promenade, wants to fill in her remaining weeks for the 2007-8 season so she is offering special rates for new bookings, including discounts for kids! Good news is that they are STILL AVAILABLE for THANKSGIVING and CHRISTMAS!!! RATES: Promenade has LOWERED their rates and now has a special rate of $500 each for kids 15-years old or younger. Let's try to clarify what that means by using a couple of examples... Promenade will take up to 10 guests or up to 11 & 12 if it is a family group (or inquire). OK... Here we go! 2 couples with 6 kids (18, 16, 14, 13, 10, 8): The 4 adults and 2 kids of 16 & 18 are $14,900 then the other 4 kids under 16 are $500 each which totals $16,900 for this group of 10 (previously $19,900/wk for 10 guests). 3 couples with 6 kids (15, 15, 13, 12, 10, 9): The six adults are $14,900 and the six kids under the age of 16 are $500 each, which totals $17,900 for this group of 12 (previously $21,900/wk for 12 guests). Minimum 6-person rate, regardless of children's ages. Kid discount kicks in after the initial 6-person minimum. Christmas week at NEW standard rate... NO holiday premium! What a nice Christmas present... Thanks, Kerry! 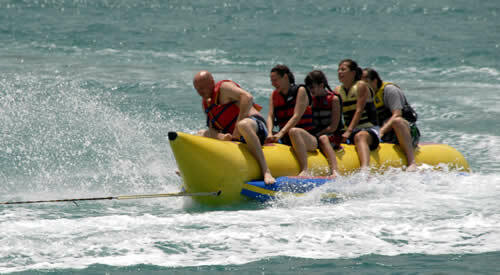 Prices include all gourmet meals, ships bar, and water sports. SCUBA DIVING: Promenade is an excellent dive boat. Crew members are Diving Instructors and they enjoy diving. Certified divers: $125/wk per diver and $125/wk gear rental per diver (BC & Reg), or bring your own! Resort divers: $75/dive per diver up to a maximum fee of $400, includes gear. 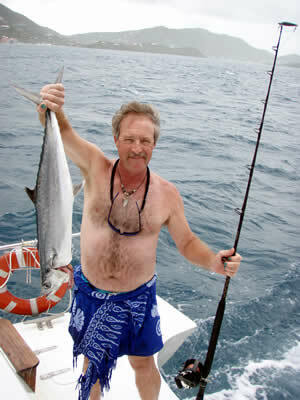 FISHING: Promenade is one of the few commercially endorsed fishing boats in the BVI. This means that you do not need a separate fishing license to fish off Promenade! In fact, they are allowed to catch 30 lbs of fish a day under the license! Lots of lounging space on the foredeck! Lots of lounging space in the water! Open March 30 - April 5, 2008: Special 6-night Cabin Cruise. $3900/cabin (not each person). Two cabins booked, but three still available Great opportunity for a couple or individual who would love to charter such a large boat at an affordable rate. CREW: Promenade's professional crew of three or four can do it all! They are an excellent choice whether for families, hard-core divers, group of friends, party-hardies, corporate incentives, etc! How did you enjoy your charter? Very much!! So relaxing, yet invigorating. Did you find your crew to be helpful, accommodating and friendly? Yes...although we were surprised to have 4 people as crew. Kerry & Bazza were helpful and Lisa & Richard were marvelous!! Richard especially helpful with the kids & fishing. Loved Lisa's cooking!! Was the yacht comfortable, clean and well maintained? Very clean...very well maintained. Hopefully we didn't trash it! Nice towels...cabins cleaned daily. How would you describe the quality and presentation of the meals served on board ? Very good, plentiful, good variety... Plenty of salads as we were promised. Even my diabetic family did fine with the menu... except for the desserts!! Too sinful!! How did you find the services offered by Paradise Connections ? Excellent. You made the whole process painless. Would you be interested in taking another yacht vacation in the future? Absolutely! We're looking at our calendar already. Will never do a BIG cruise again. We're offering a 10% discount special for all charters that are booked and that take place before Dec. 17th, 2007. Currently available Nov.11 through Dec.28 (but Special does not apply for Christmas week, of course). 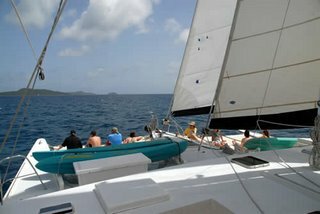 Additionally, we're offering a 5% discount special for all charters booked before the end of 2007, which take place before June, 2008. Check with Paradise Connections for availability for your preferred dates! CLICK HERE for Blu Moon's electronic brochure.